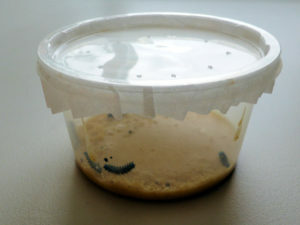 Larvae are housed six per food container. The process takes about 3 weeks from larvae to butterflies. We generally sell out a couple of months in advance, so pre-order is important. Please use our on-line order form to order for your preferred week. *Multi-kit discount applies to same invoice and same shipping date orders only. Add-ons at a later date are deemed a separate purchase and require a separate invoice. Please note: Larvae Kits do NOT include a cage. 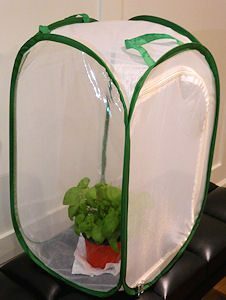 You will need a cage for the chrysalis and butterfly stages of development..
Butterfly cages have 1 clear plastic side for easy viewing. The other sides are mesh fabric. Cage folds flat for easy storage and is hand washable. Cages mesh fabric may be black or white depending on stock available at the time. Or you can download our PDF instructions here and make a simple cage for yourself.